Post the demonetization, the Indian government has come up with some unexpected rules, some were passed on just like clouds and others remained as sky now what all matters are the rules that were made mandatory and must. In a bid to rope out the black money from all the corners, banks went forward with certain verification processes, though most of them weren’t successful. Now, there’s an official statement from the government that states linking up the Aadhar card with our bank accounts are a must. 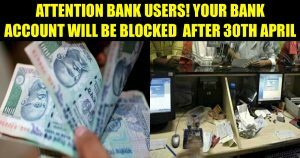 If you have opened your bank account between July 2014 and August 2015 and do not want your account to be blocked by the bank, rush to the bank to link your account to your Aadhar number. According to the notification popped out from the Income Tax department on Tuesday, accounts opened in the said period have to submit their Know Your Customer (KYC) documents and Aadhar number by 30 April, failing which the account will be blocked, respectively. In this phenomenon, Insurance and stock accounts are also included. Earlier, the government made a move on confirming the Aadhar number linkage for mobile numbers and tax filings. It is said that this step will help track tax evaders through the Foreign Tax Compliance Act (FACTA) — a pact signed between India and the US to trade tax related information contexts.